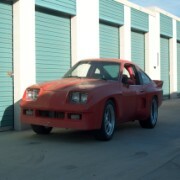 are IMSA or Mirage body kits super-rare, or can they be purchased? just a new person here wondering.... those kits look so sweet. Thanks! I don't think the MIAGE PARTS are available but most of the IMSA body panels are still listed as available. the major unavailable part being the rear 3 piece mega spoiler. most guys eventually went to wings ala the new COT cars in NASCAR anyway so that shouldn't be a big concern. the biggie is the amount of time and effort that it takes to convert to these pieces as they are race car parts and not up to factory,just bolt it on specs. it's a whole lot of sometimes frustrateing work and unless you are just building a poser there are a lot of brake and suspension mods that should be undertaken also not to mention that it's a sin not to have a muscular power plant and beefy trans to go with that 10/10ths body work. build a posermobile? .... I think not. I was just wondering if those kits were available. I've heard from a friend that races with HSR that there's a guy running a IMSA Monza that can more than hang with early 90's Trans-Am cars. I'll have to go back to the Mitty in 08 and see if I can get pics. A body kit, either Mirage or IMSA, wouldn't work with my plans. I have a pretty unique H-body I guess, and I will get a blog going at some point in the future w/pictures. It should be an interesting project to some once I can get going on it. This is my first H-body- my first car when I was a teen was a 78 Camaro, so for some reason sitting in the Monza feels comfortable. I'm not surprised that it'll hang with 90s TransAm cars. It shares much of the same suspension setup. I found one of these cars back in 87' driving around here in Paris. After becoming a member here and working on my own Monza. I thought that I would go back and see if it was still there. Well, it is. I tried to contact the people who lived there, but the neighbor said they moved and left the car. I'll take some pics of the car and post them. Maybe they'll call back and give one of you guys a shot at it. It should be bought very sheap. The body parts won't work for my application. If anyone is interested PM me. Oh BTW, I'm in dire need of a Dr. side tail light assm.
" I can't speak for everyone here, but I for one am getting sick to my stomach with all this empty yella talk. " The car is in Paris, France? Don't remember the names of the places but there is one in Chicago that at least on their site will make the parts and one in Canada that I have heard from some here is shady and unreilable. I am planning on converting mine to IMSA body. This Place makes the imsa parts. I am thinking about setting my car up with these when I get my other project done. Last time I was on the site I don't remember prices being listed. $1857 for everything you need + shipping. That's with the bolt on hood. $100 less for the pin on. I don't think the rear spoiler is included though. And you're only adding 71lbs., then figure in the weight of the stock hood and front end you'll be removing and you probably save weight. I think I know what I'll ask Santa for this year. BugsBMD wrote: This Place makes the imsa parts. Thats the place in north Chicago I had mentioned above. First time I have seen them with prices though. Since I am only 5 to 6 hours away I may be takeing a trip out there some time this year. For some "Real history" just Google DEKON MONZA.34,000 posts incl youtube in-car video.